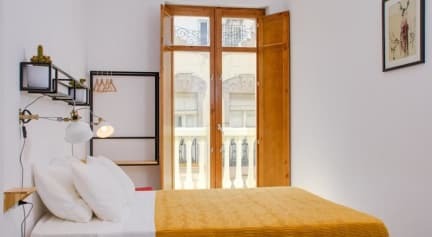 Zalamera BnB is a minute away from the train station, and situated in the heart of Valencia, between the historical center and the interesting neighborhood Ruzafa. We are a Bed & Breakfast where you will enjoy the friendly feeling of home, and a fresh, healthy breakfast, before exploring the city. 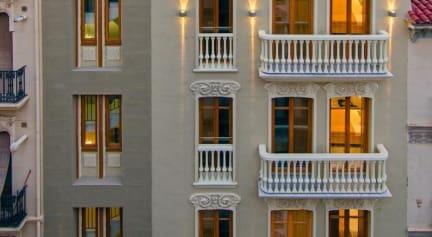 The design combines the charming 19th century style of the building with a modern interpretation of art deco. In the rooms you'll find locally produced, fresh furniture and art by local artists. In the common spaces we are enjoying the occasional vintage item, and lots of plants! The entire interior of the building has been built completely new in May 2015, with brand new facilities and comfortable rooms, equipped with air conditioning and heating. We offer a range of different room types, from a basic single room with a shared bathroom, to a luxurious double room with en-suite bathroom and private roof terrace. All rooms include bed linen, towels and shampoo. Just check out the 6 different options to see which room meets your needs and budget. Zalamera BnB is a sustainable accommodation, using bio fuel and solar energy. Charge your own battery on the large and sunny common terrace, or have a coffee in our cafe downstairs. Let us take care of your breakfast, healthy and local, while we tell you all about the many secrets of the city and the beautiful province of Valencia. Refundable rates: You can cancel the reservation for free until 7 days before the arrival date. You will pay the full price if you cancel during the 7 days before the arrival date. If you don't show up you will have to pay the full Price..
Non-refundablerates: The total price of thebookingwill be chargedwhenthebookingismade. In case of cancellation, modificationor no-show, the total price of theroomwill be charged. Very nice BnB between Valencia North Station and Valencia Joaquin Sorrolla station. Super nice staff and great common terrace. Wir hatten zwei Nächte im Zalamera BnB gebucht und waren begeistert. Die Unterkunft befindet sich zwar in China Town, aber dafür ist der Hauptbahnhof direkt um die Ecke. Die Altstadt ist auch in wenigen Minuten zu erreichen. Wir hatten ein Doppelzimmer mit eigenem Bad und waren sehr zufrieden. Das Zimmer war sehr modern und das Bett bequem. Das Frühstück ist absolut zu empfehlen! Es ist alles dabei, was das Herz begehrt und die Mitarbeiter sind sehr super!